It can be a bit tricky finding your way around Addis. In this city of four million people, only major roads have official names – Bole, Churchill, Ring Road, Victory. Smaller roads are known by landmarks, and are not signposted. There is no street signage anywhere in our neighborhood of Lebu, nor are there building numbers. Friends of ours who have been here awhile say it was only seven or eight years ago that street signs began to appear. Until then, for the most part even large boulevards were known by informal names like “Flesh Alley” (a double entendre) and “Confusion Square” (haha). Then the African Union came to Addis, and the government decided to honor the members of the Union by naming streets after the countries of Africa. Now those roads are signposted but your average person – including the taxi drivers – only know them by their old names (our school is on Mauritania Road, used to be Euphoria Road). Why not get a map? Because there aren’t any. At least no good ones. The Ethiopian government‘s security concerns make it wary of publicizing the location of anything. Official maps have to be purchased through the Ethiopian Mapping Authority, a government office with limited public access. When even those maps can’t keep up with the building boom, unofficial maps geared to tourists are incomplete to say the least. 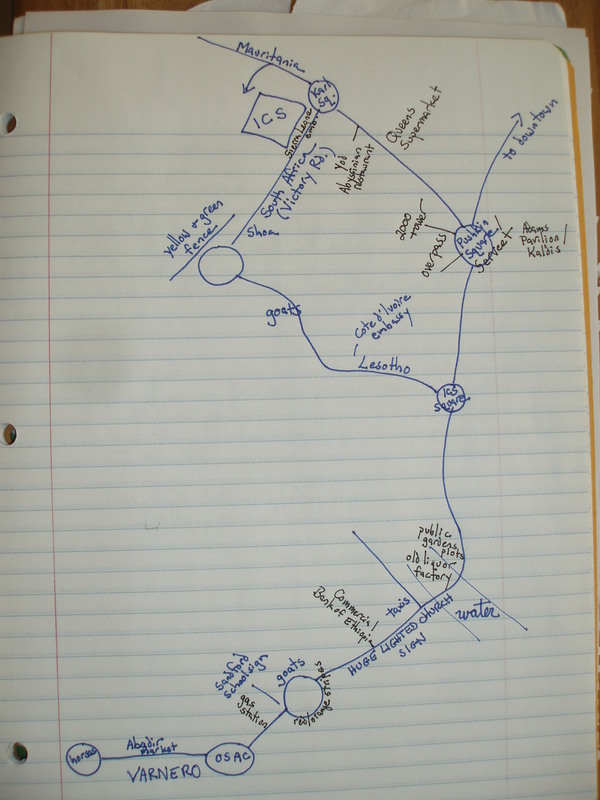 Several of the Varnero faranji realized that we would have to produce our own maps to figure out how to get to and from school, should any of us ever manage to complete the trifecta of car, license, and registration. Our hand-drawn efforts are unlovely but at least somewhat accurate. 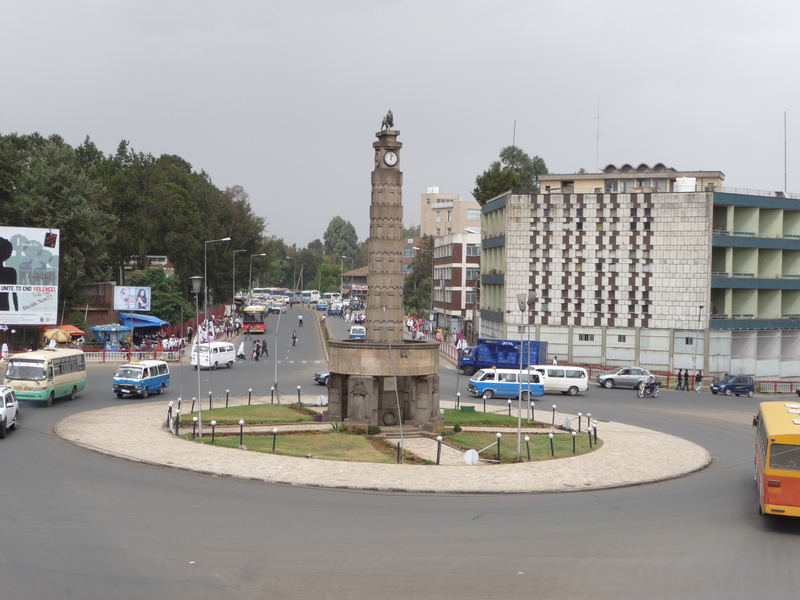 This entry was posted in Addis Ababa, Ethiopia and tagged Addis map. Bookmark the permalink. Wow, that’s crazy Lorna! It does remind me a bit of Kenya, with no street names in our village. When I went to Nairobi a few years ago, there were street signs that seemed fairly recent. The buildings had names however. And the locals and cabs knew the places to go by the building names. That’s true here, too, Kevin. We live across the street from something called the OSAC building that serves as a landmark for our neighborhood. I like goats, both alive and for dinner. But animals on their way to market often aren’t treated very well here and I haven’t quite come to terms with that yet. I often find myself looking the other way.